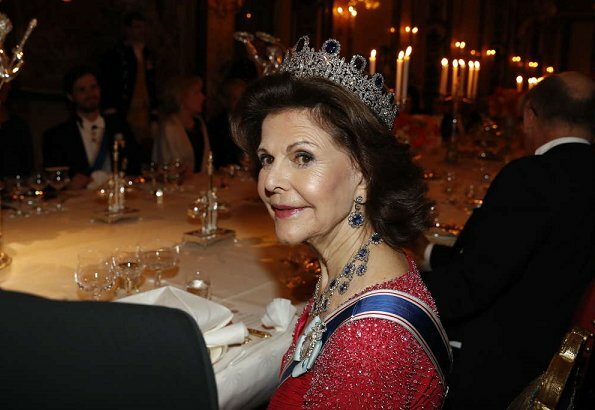 Queen Silvia looks good - her jewellery is amazing. Not sure about Sofia's dress - because she has to wear it so formally it becomes a bit middle-aged widow's weeds. I like dress but I think it needs more edgy accessories and styling for someone so young to carry it off. The photo of Sofia in three quarter profile is lovely - hair, Jewell and make up are lovely. Yes, that photo is wonderful! Sofia also miss the mark on this one. Maybe in a different color? The hairstyle.... Just no. Silvia looks better at this event that the previous one. The Queen does look great. The style of the dress and its colour are lovely. Ms. Reid looks lovely in a very elegant outfit. I'm not sure why Sofia's dress doesn't work for me. I think the high and fussy neckline along with the dark colour overwhelm her (and I usually like black). The victorian governess hairdo doesn't help. Sofia's outfit is too 'heavy' for her young age, IMO. Ms. Reid wins hands down, fantastic dress, hair and accessories. 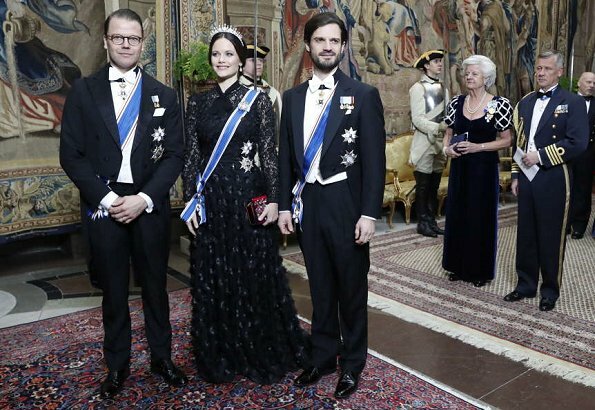 Sofia's dress is very stylish and elegant, but not with alll all the brooches, band and jewelry, too much going on, same as the queen, very busy dress . 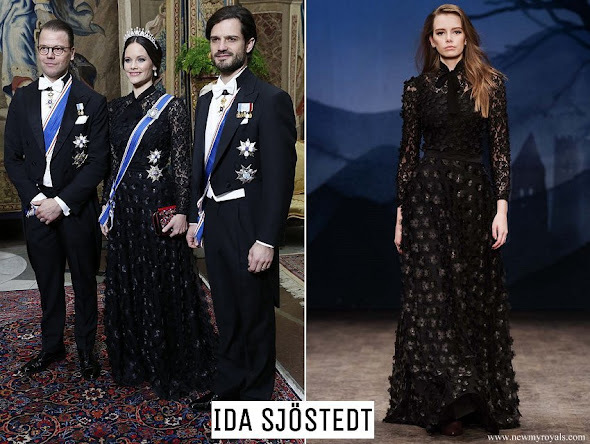 The dress looks good on the model, not on Sofia.. 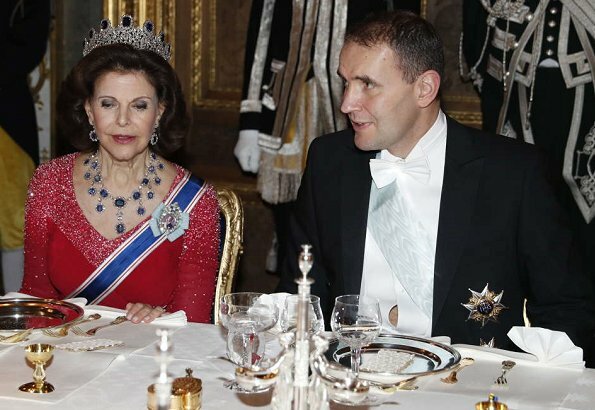 I always wonder HOW the visiting ladies from republican countries are feeling during such diners, when their hosts dress up in haute couture gala, with all the pearls, gemstones and glittering diamonds like tiara's, necklaces, bracelets, rings and earrings, brooches, etc. 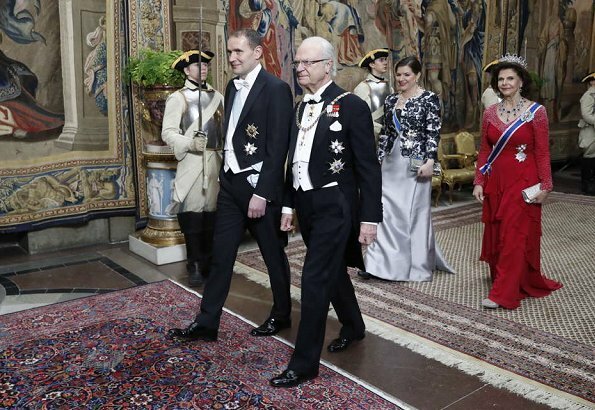 This jewelery show and pomp and circumstance must feel intimidating and somehow it makes the republican countries where heads of state and partners don't have this beautiful and expensive bling, remain a bit in the shadow. Miss Reid wasnt in the shadow in this event. She has been the glow in the events 😊😊 but yes they probably feels like someone shadow. 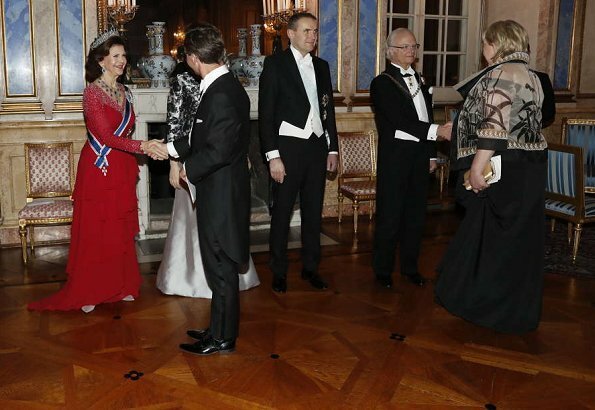 The first Lady of Iceland looks great, she does not need a tiara or medals, she radiates self-confidence, has a great posture, her dress is elegant and modern, not this fairytale princess style, that makes Sophia look old and dull and out of time. She is outshining all other ladies, even the queen. In my opinion the winner of the evening. 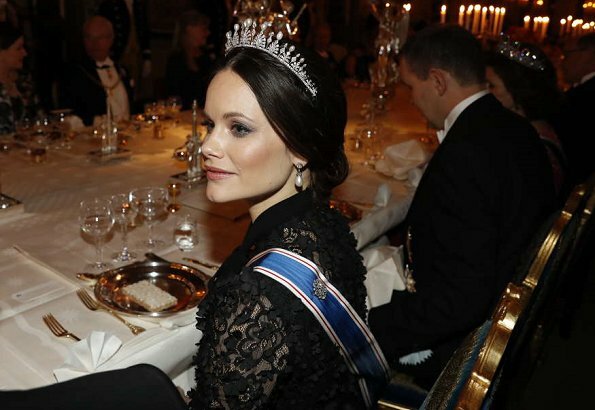 Most republics by the way were monarchies in former days and still possess the most amazing jewelry. 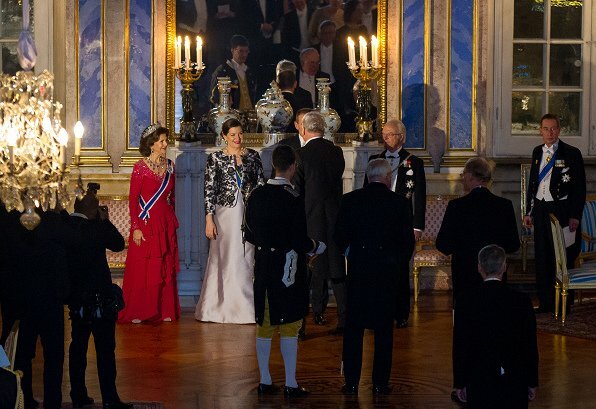 Why can't first ladies use/wear this jewelry as well,instead of keeping it in vaults or museums, so we don't see so much difference in presentation between republics and monarchies. 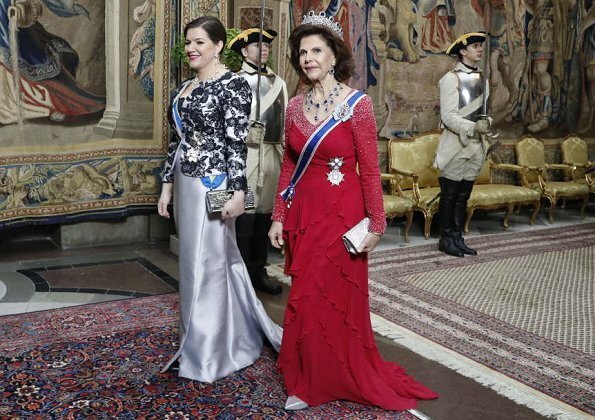 La princesse Sofia est très jolie. Cependant, je trouve qu'elle ne porte pas souvent des tenues qui sont de son âge et qui la mettent en valeur. Ici, la coiffure lissée en chignon et une robe trop sombre la vieillissent inutilement. 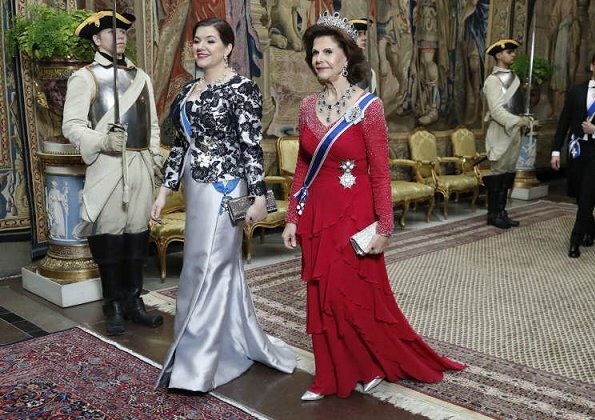 Quant à la reine Silvia, j'aurais préféré une chaussure de la même couleur que la robe tout en maintenant le sac argent. Well maybe I'm the only one but I love Sofia's dress I would love to wear it or something similar. Her choice of hairstyle isn't the best but I guess that's what she prefers on herself because we have seen her with this hairstyle a lot and probably we will in the future. All in all I think she looks gorgeous. No I love the dress but I think the styling is wrong. Maaybe these pictures do not make her justice. I saw other pic sand she looks there lovely. the first lady is lovely..and for sofia to be wearing black..maybe not now darling..